Apartheid pervaded every facet of life in South Africa, and sport was no different. Black sportsmen and women were unable to compete on an equal footing, and the sports boycott made the country a pariah state. But marathons offered an open road to all. 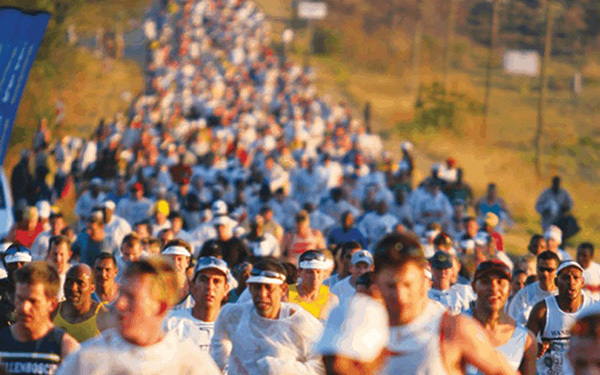 The most memorable Comrades Marathon of the apartheid years was probably run in 1981, when many runners boycotted rather than help the country celebrate 20 years of National Party rule. Others opted to run wearing black armbands to show their protest internationally. For runners like Bruce Fordyce, it was a not-to-be-missed event, one he still remembers today. They took part in the race to make a bold statement, he says, that they protested, because they wanted freedom for all in South Africa. This protest was a small drop in the ocean, he admits. 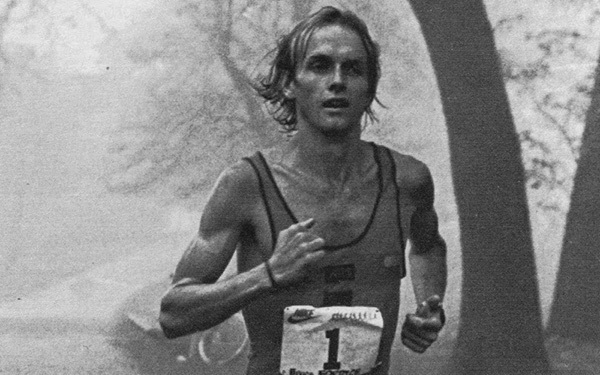 Fordyce, an international running legend, was born in Hong Kong before moving with his parents to South Africa when he was 13. 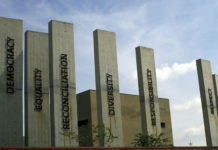 “I couldn’t believe apartheid,” he says of settling in the country. 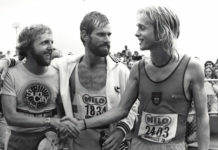 Besides winning the Comrades nine times, Bruce Fordyce won the also won the London to Brighton Marathon three years in a row. 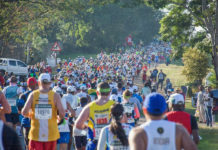 The Comrades Marathon is the world’s oldest and largest ultramarathon run over a distance of approximately 90 kilometres, or 56.1 miles, between the inland capital of Kwazulu-Natal, Pietermaritzburg, and the coastal city of Durban. The race route alternates – uphill one year followed by downhill the next year. It was started in 1921 by Vic Clapham, a returning serviceman, after the end of World War 1 as a tribute to the many men who died in the Great War. The famed camaraderie of the race – which is still a hallmark of the marathon today – had as its basis the memories of the war. 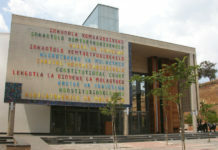 Fordyce has participated in the Comrades Marathon since 1977. He has won it a record nine times, of which eight wins were consecutive. He has shared his memories of the race, in which black runners were able to compete for the first time in 1975. That year, the race was officially opened to runners of all race groups and to women. 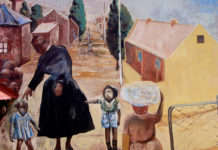 Prior to 1975, Natal and South African Athletic Association rules prohibited women competing with men, juniors with seniors, and except with government approval, blacks competing with whites. Vincent Rakabaele was the first black man to get a medal in the Comrades history. Robert Mtshali was the first unofficial black runner, doing the Comrades in 1935. The first black runner to win an official Comrades Marathon medal was Vincent Rakabaele, who in 1975 finished in 20th position. He ran again in 1976 and 1975 finishing fourth and eighth. On 2 April 1988, Thompson Magawana broke two world records and established a course record for the Two Oceans, the annual marathon run in the Cape peninsula, Western Cape. 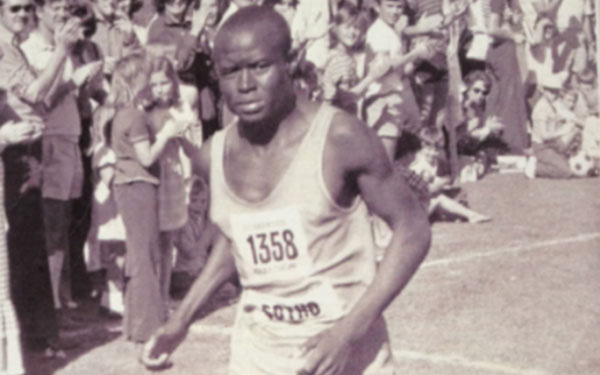 Runners World, a running magazine, reported that Fordyce said although Hoseah Tjale, another South African, never beat him in a Comrades race, he was one of the former’s top 10 competitors. “With the exception of the Comrades, ‘Hoss’ won every major South African ultra and the London to Brighton. He came desperately close to winning on a couple of occasions and earned nine gold medals,” Fordyce explains. In 1989, Sam Tshabalala became the first black athlete to the Comrades Marathon. Tshabalala, who lives in Sasolburg with his wife and eight children, told online news portal IOL that when he won the Comrades he was ecstatic and that most people shared his joy. Tshabalala’s running career was cut short after he was involved in a car accident in 1991 in which his feet were badly injured. “I miss running a lot,” he says, adding that the Comrades has changed over the years, with more high-calibre runners than in the past. The second black winner was Jetman Msutu in 1992. Charl Mattheus crossed the finish line first, but he was later disqualified after testing positive for a banned substance. Msutu was elevated to first place. 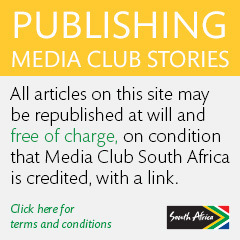 Bob de la Motte also said to News24 that the speed of black runners excited their audience. “When these guys ran, they were running for records. Watching them, everyone was excited,” he reportedly said.